A view from the cycle path: A "magic" roundabout ? The Crap Walking and Cycling in Waltham forest and As Easy as Riding a Bike blogs have both recently posted interesting critiques of the "Magic Roundabout" in York ("spin over substance", "Putting some paint around the circumference of a roundabout does precisely nothing for cyclists", "Would you want to send your child to school on cycling infrastructure like this?"). Elsewhere it is described as a formidable obstacle for cyclists. Courtesy of Bing Maps. This design has similarities with the worst roundabout designs ever used in the Netherlands but little in common with the safest roundabout designs. The CTC wrote about it in 2003 (page 6 here), saying much about the "continental style" of this roundabout and implying that it was influenced by the Dutch by referring to CROW documentation from the Netherlands (amongst others) as being an inspiration. On the Magic Roundabout, cyclists are encouraged to use a 1.2 m wide on-road cycle lane which goes all the way around the outside, and on one entry point they're expected to use a cycle lane of the same width sandwiched between two lanes of motor traffic. Note that in Assen cyclists do not ride on the road around roundabouts, but have completely separate paths. Read more about this roundabout, which is a good example of the safest design in the Netherlands. These aren't particularly busy roads, but that doesn't mean that cyclists aren't better off away from them. There is no need to ride on the roundabout itself at all. Cycle paths around this roundabout are 2.5 m wide where single direction and 4 m wide where bidirectional. Approaching and riding past this Dutch roundabout involves no conflict and no drama. No-one has concerns about riding here themselves, and no adult has concerns about their school age children cycling past this junction. This is just as well because many go past here in order to get to school. This type of infrastructure contributes to the high cycling rate of Assen, and as similar roundabouts are found right across the country, to the high cycling rate of the Netherlands as a whole. What's more, this is also extremely efficient for a cyclist to use. You never have to stop when riding in this direction, and rarely in the opposite direction. In my view, this is truly a "magic" roundabout because so far as cyclists are concerned, it's almost been made to vanish. Guess which one won an award ? this dangerous design should never have won an award. Unlike the York roundabout, the example in Assen didn't win any awards. No-one said that it was a novel idea which "should be copied by other engineers around the world." (just a few days after this blog post was published, that link was password protected - I guess someone in York reads this blog). No consultancy company still refers to it as an example of their award winning design. For the Dutch, this is nothing but a normal roundabout. In any case, people don't seem to be quite so keen on handing out awards for things like this on this side of the North Sea. 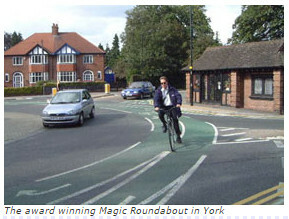 The problem with things like the Magic Roundabout in York is that sometimes the hype gets out of control. It may well be a safer design than the previous junction, but it's a missed opportunity. It could have been so much better, but as so much hype and praise is heaped upon the roundabout it's difficult for other people to notice this. The hype is still believed. Cycling England referred to it quite positively, there have been proposals to copy the "Magic Roundabout" elsewhere in the UK, similar ideas are published as guidance in Australia. The BBC recently said that the "British roundabout" might be conquering the US, and a much hyped example like this could well be held up as a better than average design to copy. It is often difficult to counter the opinion of an "expert". However, it seems quite clear that in reality the Magic Roundabout shouldn't be an example which is copied. Planners who want to do the right thing for cyclists would be better advised to look at Dutch examples instead. 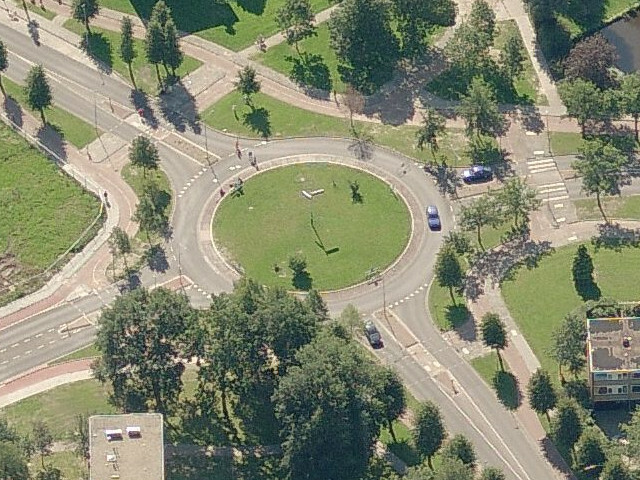 The Assen roundabout used as an example in this blog post is not unusual. Another post details every roundabout in Assen. Every single roundabout in Assen uses a better design than the "Magic Roundabout" in York. I guess the magic thing is that there are actually cyclists visible on Google street view, including a boy without a helmet (who's about to get sandwiched between a bus and a car) and a female with a purse. When you move down the streets, all cyclists seem to have disappeared. This made me think of the actual "Magic Roundabout" in Swindon - which constitutes a large 2 way roundabout with smaller normal roundabouts at each exit - a bit like a scaled down ring road. Do such junctions exist in the Netherlands, (hopefully with a cycle track avoiding them) or are they just a rarity of British traffic planning? Is this some sort of sick joke? Seriously, what **were** they thinking? Roundabouts with 'improvements for cyclists' in Australia have a green painted cycle 'lane' around the outside (if you're lucky) which requires cyclists to give way to cars leaving the roundabout - they have to stop ON the roundabout! Madness. The biggest problem is that roads here are geared towards maximising traffic flow (and speed) and requiring drivers to pay less and less attention to anything else out there. If you're in the way of a car driver exiting a roundabout here (as a pedestrian or cyclists) you'd better run for your life... Most drivers treat them like racing chicanes and will make no effort to give way. 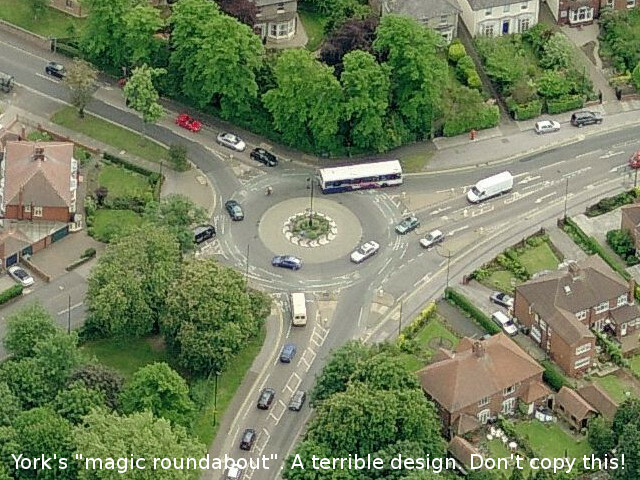 Look at how the UK roundabout has tangents to allow drivers to go fast-in, faster-out. Compare this with the radii on the NL example. If the UK is ever to be cycling-friendly it has to follow the Dutch. We need a major programme of public works (ie a multi-million pound major schemes bid) to show what can be done. I've been reading recently how the UK only has 10% of people cycling and therefore it's a small issue at election time. People want Dutch-style cycle routes. Let's turn up the volume! @chris the bull: Colchester and Hemel Hempstead have similar magic roundabouts to Swindon, all invented by a Colchester road engineer in the 1970s. In fact the creation of the magic roundabout in Colchester led to the birth of our cycling campaign in 1990. The multiple roundabout is safer (but more offputting) to ride around than the roundabout it replaced. I'd still rather have David's roundabout, though. Cyclo: Yes, you're right. It's much slower driving across a Dutch roundabout. Also, they tend to have a reverse camber so that you really wouldn't want to try to drive too quickly around the roundabout. All: Please do "turn up the volume" ! Britain can have decent cycling provision, but only if people ask for the right things. I can't help wondering what Conservative 'cyclists' like Andrea Leadsom was doing during all this? Or was her Ten Minute rule bill just a publicity stunt?